Brighton is a well-known mecca for hedonistic weekends, but make sure you plan your boozy weekend in style rather than heading straight to the nearest station’s pub. Cult seafront arts and culture venue Patterns will be throwing a free World Gin Day party from midday on Saturday 11th June, complete with live swing band The Swing Ninjas, a menu of over 30 different gin and tonics to try, prizes for the best dressed, and some rather special gin infusions made in-house including Hot Dog Gin Bloody Marys and glittery Mermaid Gin Martinis. Plus, dig out your best Hawaiian print and Del Boy swagger on Sunday July 10th as Patterns go Coco Loco and celebrate National Pina Colada Day in a Sunday Social Club Special. With the introduction of a Pina Cola-Dog hotdog – a BBQ’d meat or veggie hotdog with pineapple salsa loaded topping, plus bottomless Pina Coladas from 12 – 15:30pm. Expect tropical party beats, a ‘Do You Like Pina Colada?’ love match and watch out for an appearance by Pattern’s own Del Boy lookalike! A quintessentially quirky Brighton day out, the annual March of the Mermaids sees hundreds of people dress up ‘under the sea’ themed and march through the streets of Brighton and Hove to raise awareness of Marine conservation, and celebrate the sea! Join the parade of mermaids, mammals, crustaceans, pirates and sailors from 1PM for the walk, or simply watch the action unfold from the side-lines. The parade ends at 4.15pm at Patterns on Marine Parade for an all-ages-welcome after-party with the Captains Beard and Sophisticated Mischief DJs, a costume pageant and prizes awarded for best children’s costumes. Tickets to the parade party are £4 (Under 12s FREE). There will be a further ‘Fin-ale’ after-party, for adults only, later in the evening, which will include the crowning of our Queen Mermaid and King Prawn. Patterns has put Brighton firmly back on the map with forward thinking club programming (winning DJ Mag’s best Small club in its first year of opening), however what you may not know is that they also book plenty of bands. This is your chance to see new music in a way more intimate setting than your typical London show. Forthcoming highlights include, Lady Leshurr, The Hunna, Cate Le Bon, and alt rock and neo-psychedelia Australians Jagwar Ma in May and King Khan & The Shrines and Braids in June. Patterns are also partnering with Boundary Festival on Saturday 17th September, a brand new day festival in Brighton (midday – 10pm) representing Brighton’s vibrant nightlife across four stages. Early line up announcement includes Seth Troxler, Joy Orbison, Bondax and Jungle. Tickets from £22.50 + BF and on sale HERE. If you prefer to dance in the daylight with sea views and um… a sausage in your hand, Patterns will be throwing open the doors of their lovely summer terrace on Saturday 7th May for their first birthday and then hosting Summer Sizzler Terrace parties every Saturday afternoon thereafter. Partnering with The Dog Haus, every Saturday will also involve a sizzling BBQ, weather permitting. Plus you can always phone ahead and reserve you and your friends an area inside the light-flooded ground floor bar. Shaking up Brighton’s weeknights with a free evening of burlesque on the first Tuesday of every month, this fabulous night of glamour was started by one of the venue’s very own Bar Managers and Brighton based burlesque star – Lady Marmaduke. Dirty Bare’s forthcoming themes included ‘Drag It Up’ on Tuesday May 3rd – a celebration of all things drag and ‘Under The Sea’ which ties into Brighton’s celebrated annual March Of The Mermaids event in July. DJs after, till late. Obviously, you can do this in London but it’s just more fun in Brighton. Plus if you find romance it’s definitely commutable. Patterns FREE weekly Sunday Social Club programme of events are a combination of daytime DJs and quirky cultural events hosting the spacious ground floor bar are an excellent way to familiarise yourself with new faces. Event partners include Buggied Out, Musical Bingo, Monthly Milk and Home Service. 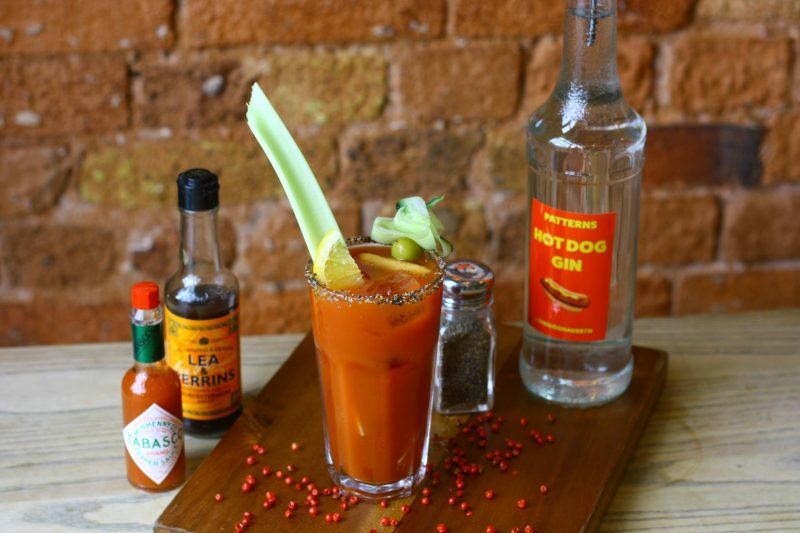 Bottomless brunch offers run all afternoon on both Bloody Mary and Prosecco for just £15, which includes a delicious loaded gourmet hot dog, courtesy of The Dog Haus.